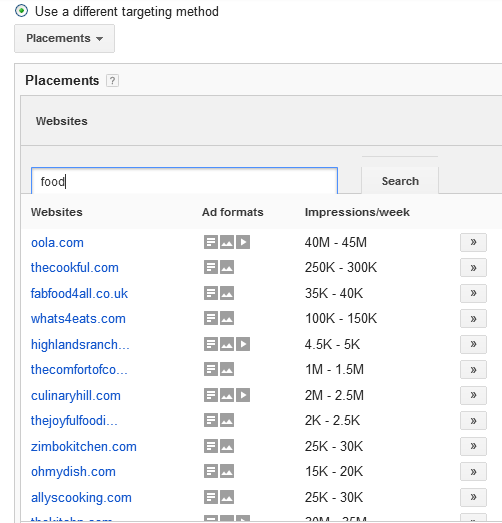 Home › Webmaster Tools › How to create a display network campaign for Adwords? How to create a display network campaign for Adwords? 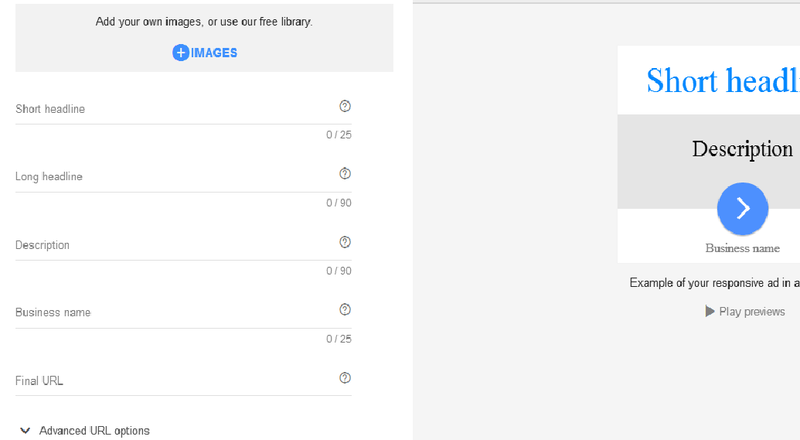 Although display network ad in Adwords is basically a piece of junk, you might want to have a try to prove it. You can choose between “Marketing objectives” and “No marketing objective”. If you choose “Marketing objectives“, you can select one marketing objective from several. Choosing different marketing objective means different default bid strategy you’ll see below. Of course, google won’t reveal much information about the details of a bid strategy. For example, if you set the marketing objective to “Build awareness/Get customers to:See your ad“, you will find the bid strategy is set to “Viewable CPM” although you’ll never know how this bid strategy works. I think you’d better choose “No marketing objective” and this will set the bid strategy to “Manual:Manual CPC”, which is simple to understand. There are many other options, but most of time you only need to set the “Campaign name” and the budget per day, and leave others at default. Click the “Save and continue” button. 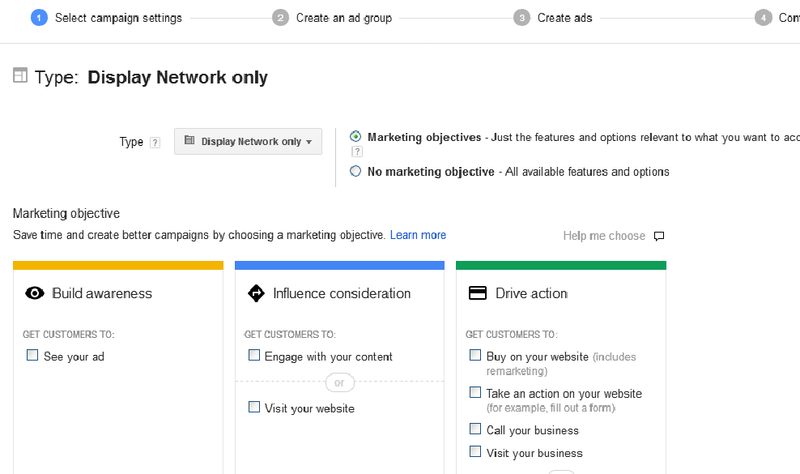 Now you’ll need to create an “Ad group” by specifying a name,max CPC bid, and how to target your ads. Display keywords – show ads on sites related to your keywords. 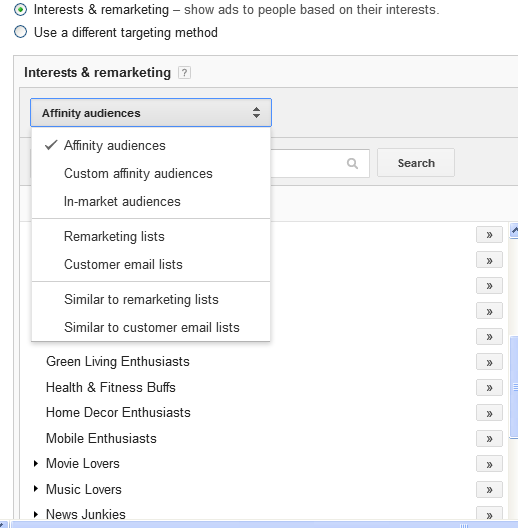 Interests & remarketing – show ads to people based on their interests. If you choose “Display keywords”, you’ll need to input the keywords that are used to find the websites to show your ads, i.e. your ads will be displayed on web pages that talk about the keywords you entered. This is different from the keywords for search campaigns, where the keywords are the ones people input in the search box and trigger your ads. 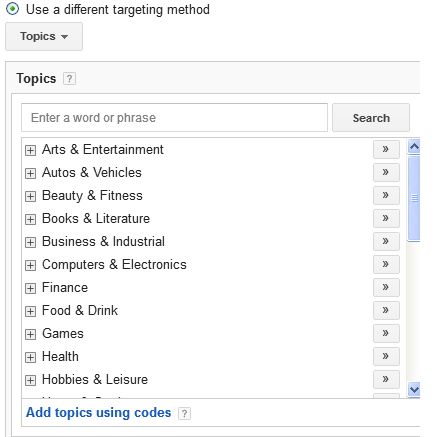 The “Topics” option allows to select a range of topics the web pages showing your ads talk about. The “Placements” option is the one I personally like. It allows you to select exactly the websites you want to show your ads. You can type a word, phrase, or website to search for all the websites that have ad space for you to bid. 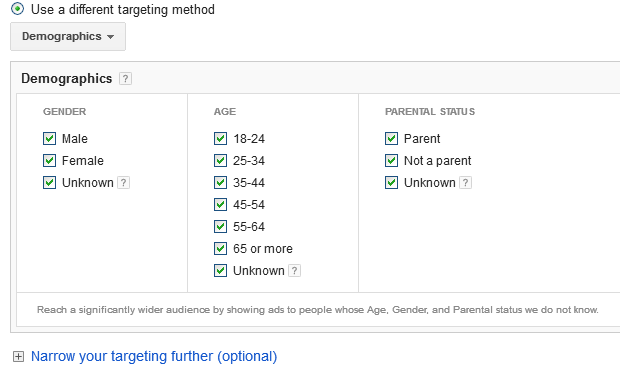 The “Demographics” option allows you to target ads towards specific type of persons whose privacy information is gathered diligently by google. After defining the Ad group, you are asked to create ads in that Ad group. You can create two kinds of ads: Image ad and Responsive ad. ‹ How to set up sendmail on CentOS?